Coupons have proved to be an excellent way to attract customers to your store whether it is online or not. You can use it to offer discounts and rewards for the purchase so that the customers would want to return to your store again and again. This article will take you through the process of setting up coupons in your WooCommerce store. In order to activate coupons on your site, you first need to go to WooCommerce > settings > checkout on your dashboard. The screenshot of the opening page is given below. Enable the checkbox which says enable the use of coupons. The next check box is only applicable when you apply multiple coupons. When the page opens up click on either create your first coupon or Add coupon since both lead us to the same page. There is a field for entering coupon code ie; code used by a customer to apply the coupon. Must be unique as it is used as an identifier. Description(optional) field is where you enter all the coupon info ie; Dates in effect, compensation, ticket number etc. Now let’s click on the first tab General, below coupon data. 1. Discount types – There are three discount types available in the drop-down. Percentage discount – A percentage discount for the entire cart ie; if the cart contains three bags @300 Rs each the total price would be Rs 900. And a discount of 10% will reduce the total price by 90. Fixed cart discount – A fixed total discount for the entire cart ie; if a cart contains two books of 500 Rs each, the total price would be Rs 1000. A discount of Rs 100 reduces the price to 900. Fixed product discount- This kind of discount only applies to selected products in the cart. 2. 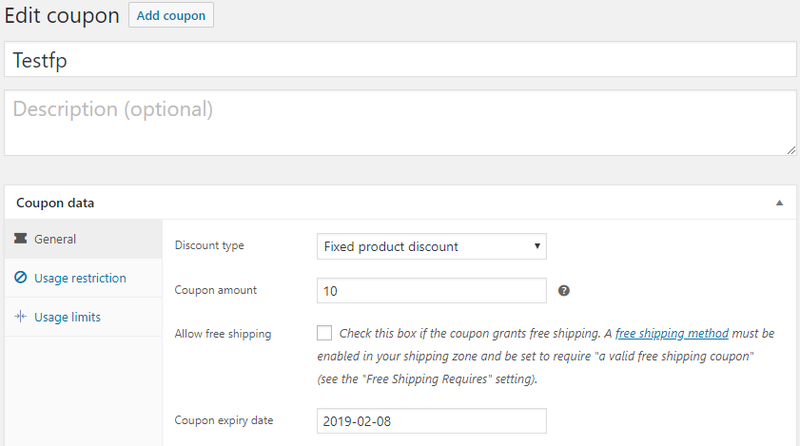 Coupon amount – Fixed value or percentage depending on the discount type you have chosen and it is entered in the field without a currency or percentage sign for it is automatically entered. 3. Allow free shipping – Tick the checkbox in order to allow free shipping. A free shipping method must be allowed in your shipping zone. 4. Coupon expiry date – Coupons will only be available for a certain period of time, in order to deactivate it after that period, you need to set an expiry date for the coupon. Now click on the next tab usage restriction. 1. Minimum spend – The minimum purchase amount required for a coupon. If you left it empty purchase of any small amount would receive a coupon. 2. Maximum spend – The maximum amount up to which the coupon will be available, exceeding this amount will not yield a coupon. 3. Individual use only – If the coupon has to be used individually and not with other coupons, you have to enable the checkbox. 4. 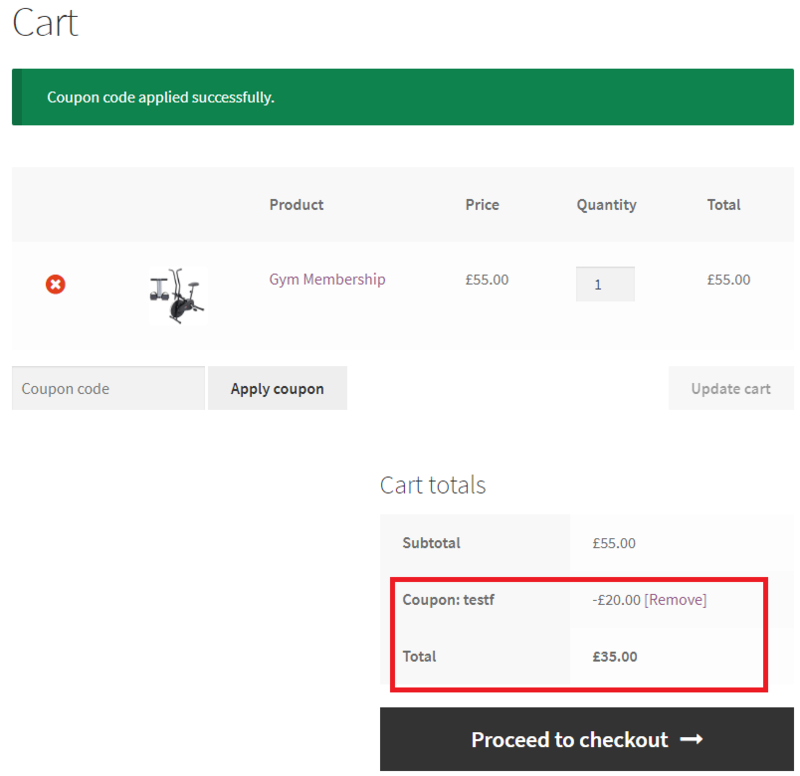 Exclude sale items – You can enable it if the coupon should not apply to items on sale. 5. Products – Enter products that the coupon will be applied to for the fixed cart discount to be applied. 6. Exclude products – Products that the coupon will not be applied. 7. Product categories – Product categories that the coupon will be applied to in order for the fixed cart discount to be active. 8. Exclude categories – Products categories the coupon shouldn’t apply to. 9. Email restrictions – List of allowed emails to check against the customer billing email when an order is placed. Emails should be separated by a comma. The final tab is usage limits. Clicking on it will open up a new page. Now let’s get familiar with each of these entries. 1. Usage limit per coupon – The number of times the coupon can be used before it is invalid. 2. Limit usage to X items – The maximum number of individual products the coupon applies to. 3. Usage limit per user – The number of times the coupon can be used by an individual user. On reading the above paragraphs, you might have got an overall idea regarding how to deal with coupons in your store. Now let’s see with the help of screenshots how to apply coupons to products in your store. 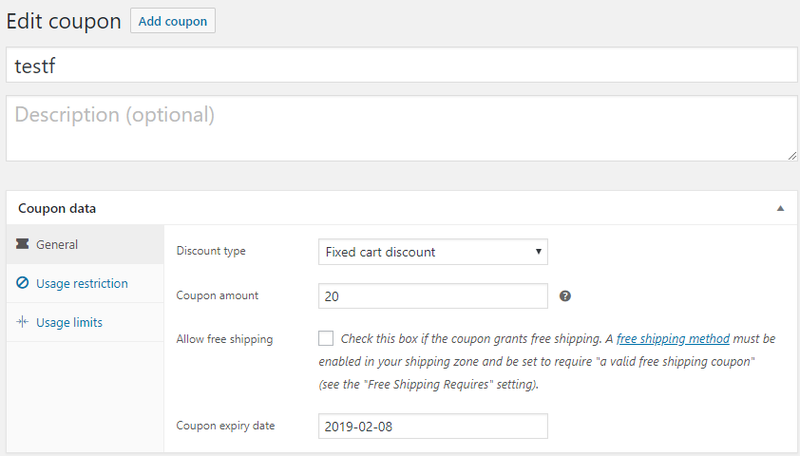 For applying the coupon, first, create a coupon by navigating to WooCommerce> Coupons. A coupon “Testp” has been created with a discount value of 5%. A customer applies the above coupon to a product from the cart page and the total cost shows a reduction of 5% of the total price. A fixed cart coupon “testf” of value 20 has been created. When the customer applies it to a product from the cart the total price of the product shows a discount of 20. A fixed product coupon is”Testfp” created of coupon value 10. On a customer applying it to a product, the total price of the product shows a deduction of 10.